Nineties kids may have fond memories of the troll dolls with the big bright hair that could be styled every which way. The toys have been around since the 1960s, with revivals occurring every couple of decades. In 2016 they make a return in computer-animated form, and their hair is as fabulous as ever. 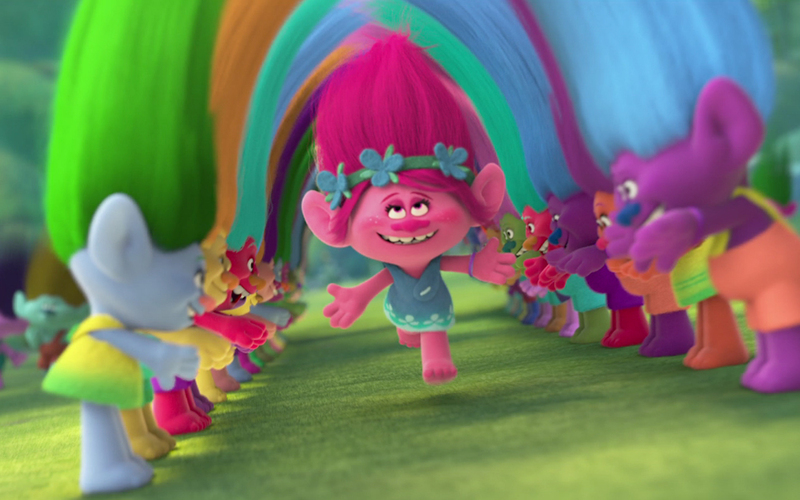 Poppy (voiced by Anna Kendrick) is the leader of the trolls, a singing, dancing, hugging big-haired tribe without a care in the world (think the cast of HAIR the musical but with more clothes). The only one really concerned about their safety is stick-in-the-mud Branch (Justin Timberlake) who fears the trolls will be found by the Bergens, large creatures who eat trolls in the pursuit for happiness. After a handful of trolls are kidnapped by the ghastly Chef (Christine Baranski) it’s up to Poppy and Branch to find them before they end up as dinner for King Gristle (Christopher Mintz-Plasse) and his fellow Bergens. 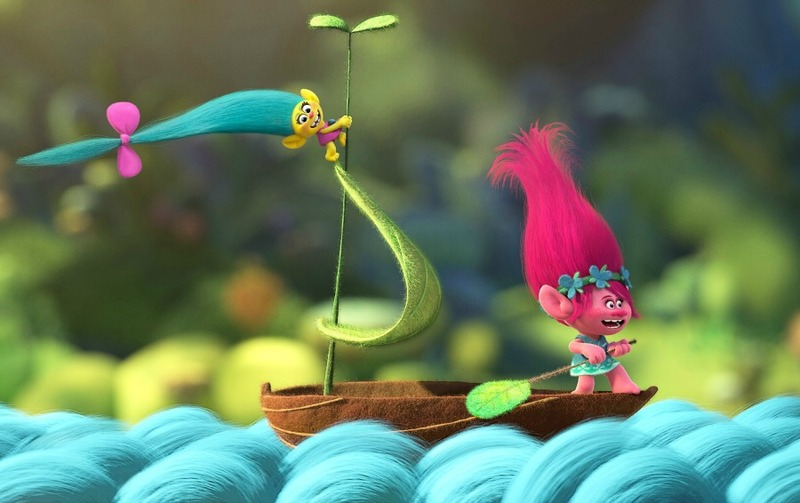 In some ways, Trolls is standard kid fare that adheres to the old clichés. While Dreamworks Animation are slowly starting to match the standard put forward by Disney and specifically Pixar, they don’t quite break the boundaries in the same way. There are a couple of traditional love stories in the mix; the lead female troll is pink, the male blue. And there’s a makeover involved. There’s something disheartening about the way children’s films can seem so hesitant to challenge the norm, especially when they are such a good vehicle to teach kids about the world. In its defence though, despite the makeover, lowly scullery maid Bridget (Zooey Deschanel) ends up being appreciated for who she is underneath the hair, make-up and new clothes, so it’s at least an improvement on Grease. One thing that most children’s films do seem to do right, however, is the message. The message at the heart of Trolls is simple: everyone has happiness inside of them, and it can’t be acquired just by having stuff. Trolls does run the risk of incorrectly and unhelpfully insinuating that it’s possible to be happy all the time, but it does make sure to include the experiences of pain and fear to balance this out. Poppy tells Branch: “I know it’s not all cupcakes and rainbows, but I’d rather go through life thinking that it mostly is”. Now I want a cupcake. The screenplay by Jonathan Aibel and Glenn Berger (together responsible for the Kung Fu Panda franchise) is consistently funny and made this reviewer truly marvel at the high standard of animated films on offer in this day and age. Adults can most definitely get a kick out of the dry wit used throughout. Boosting the entertainment factor are the musical numbers, which are woven well into the narrative and are joyous in their execution. Justin Timberlake is the executive producer of the soundtrack but funnily enough doesn’t even sing until late in the film. But that’s no drama because we have Anna Kendrick to remind us why we love her from the get go (and thank god she replaced Chloe Grace Moretz). On the whole, the A-grade voice cast – which also includes James Corden, Russell Brand, Gwen Stefani, John Cleese, and Jeffrey Tambor – boosts the film up a further notch. 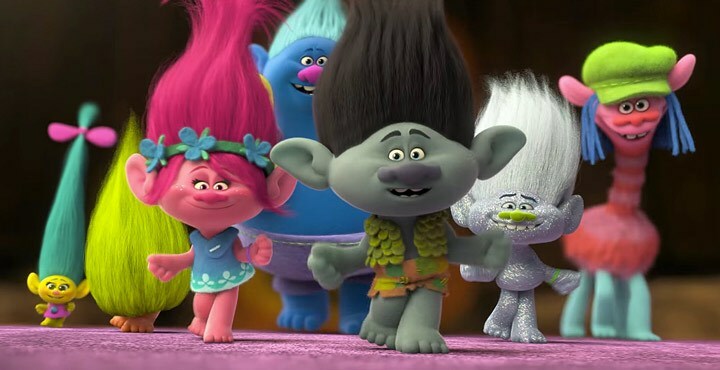 Directors Walt Dohrn and Mike Mitchell have delivered quality entertainment in Trolls. 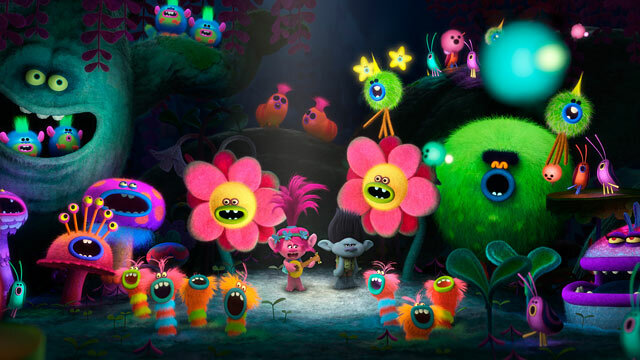 The colours are bright and the animation is excellent, especially in its use of the trolls’ hair which works as various set pieces. It’s well-paced, consistently enjoyable, and has a good message and stellar soundtrack to boot. Parents better get out their wallets – those troll dolls are going to be trending again very soon.